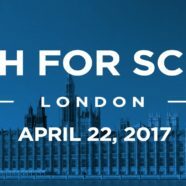 On 22 April the London March for Science will go forward in solidarity with our colleagues in the US and around the world as a massive, diverse, non-partisan, and celebratory demonstration of public support for science that highlights challenges facing the scientific community and will act as a catalyst for ongoing public action around specific issues. Scientific progress and freedom is under threat on a global level – from the policies of the new US administration, uncertainty around the impact of the EU referendum, and a broad increase in anti-intellectualism and resistance to facts that contributed to both. One of the most effective ways to protect science is to encourage the public to value and invest in it. The goals of the march are very much in line with the ASB’s interdisciplinary and international approach. The march aims to be a celebration of progress, raising awareness of the accomplishments and impact of science over time. It’s not so much about scientists or politicians, as it is about the very real role that science plays in each of our lives and the need to respect and encourage cross-border research that gives us insight into the world. The London March for Science is part of this global movement that recognises the need to preserve the productive and diverse research partnerships in the UK and around the world.